There’s a lot to love about cats, but there’s one thing that even the biggest cat whisperers out there can’t stand: litter boxes. Unfortunately, a litter box is an unsightly necessity that will stick out like a sore paw no matter what room you try to hide it in. That’s why more and more homeowners are opting for hidden cat litter boxes that are out of sight for guests but still easily accessible for our furry friends. As it turns out, there is no shortage of creative ways to disguise a litter box in your home. Have a less frequented room in your house, such as a storage or furnace closet? 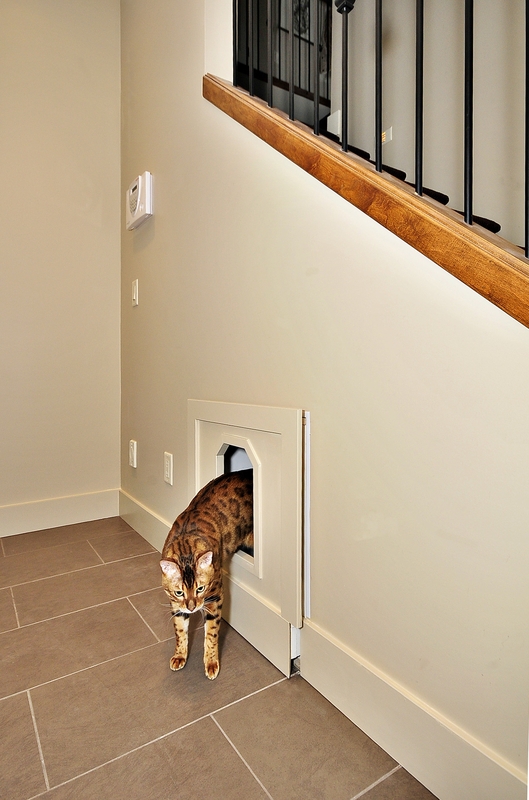 Install a kitty door in the wall, place a litter box in the room and you’ve just turned that unused space into the ultimate hidden cat bathroom. Transform any side table into a kitty corner. Start by placing a litter box under the table. Next, attach two small window valances to a tension rod and place it between the legs of the table to form a curtain. To make it even more multi-functional, wrap sisal rope around the table legs to transform them into scratching posts. This is a real space-saver if your litter box is already in your bathroom. Simply place it in the cabinet underneath your sink, and then have a hole cut out on the side to give your cats easy access. The shut doors will also provide great odour control! 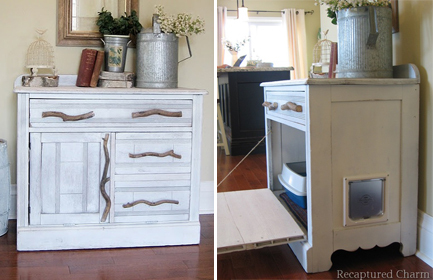 There are many pre-built or DIY options for repurposing a cabinet as a litter box cabinet, with a cat entrance on the side for easy access. 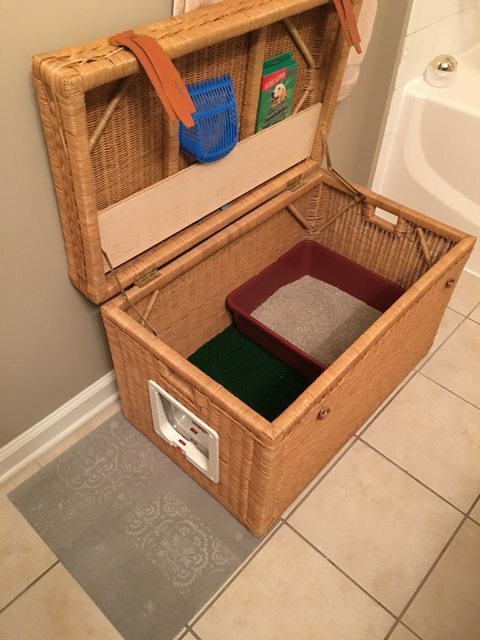 Plus, with extra drawers for storing a scoop, brush, and treats, this can be the ultimate hidden litter box solution. Just put a few pictures or plants on top and no one will know! 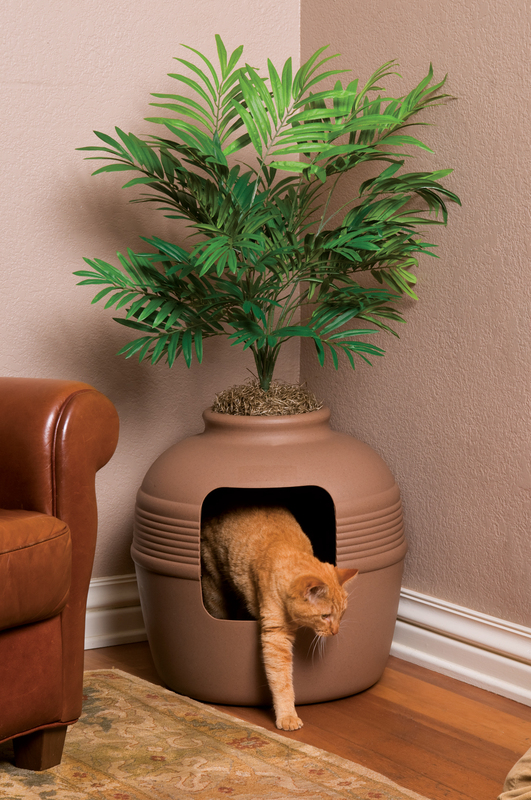 This litter box dual purposes as a room accent with a real plant on the top. 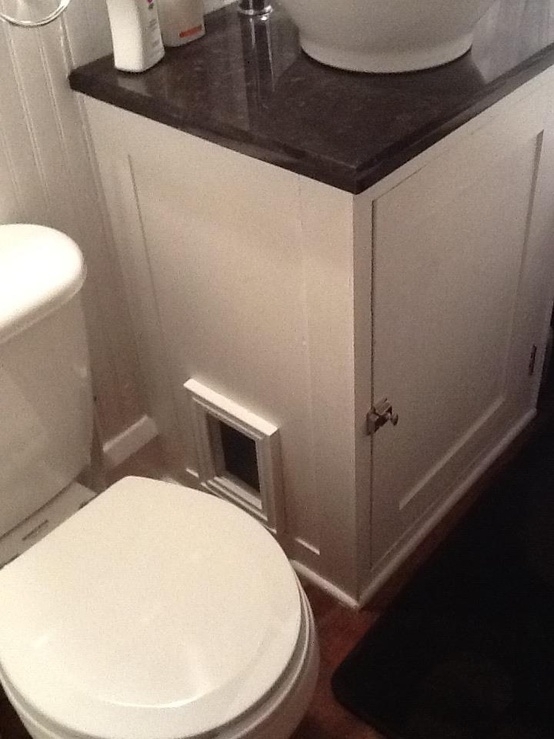 Rotate the unit so that the entrance is out of sight, but still provides enough room for your kitty do her business. To help with odour control, try planting a fragrant, pet-safe plant like Orange Jessamine or Sweet Bay. Transform any trunk into a litter box by installing a kitty door on the side and placing a litter box inside (provided there’s enough room for your cat to move around). For even more space-saving, store a scoop, litter box liners and other supplies on the underside of the lid, making it a really efficient covered litter box solution. 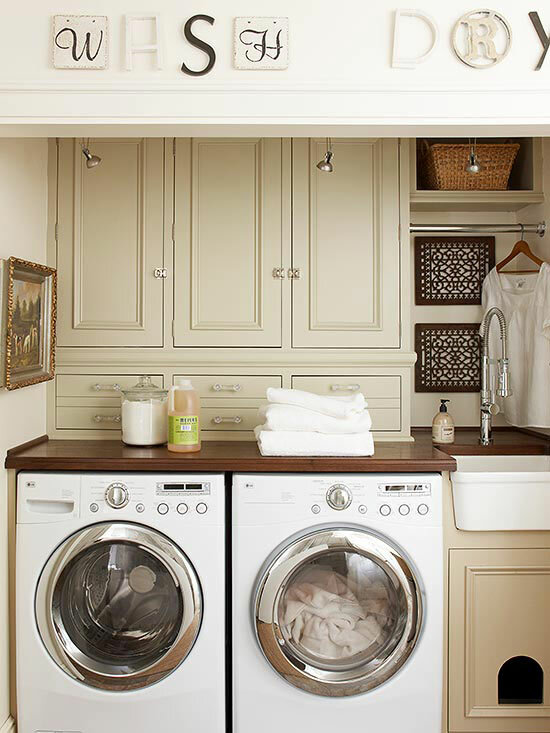 This works particularly well for renovated laundry rooms, which will often have ample storage space that can be repurposed for hiding a litter box. Cut a cat flap in the door underneath your sink or any other cabinet and place your litter box there. As an added bonus, the smell of fresh laundry will help mask the litter box odours. 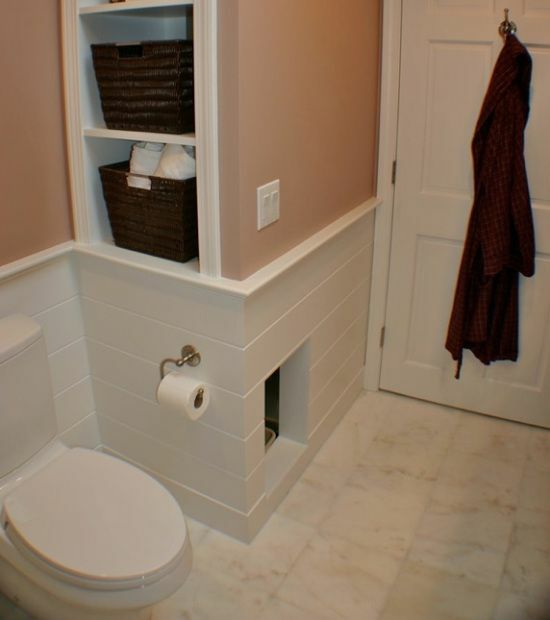 If you have some extra space in your bathroom, consider adding a section to store towels, linens and toiletries, and have a potty door at the bottom with an area just for the cats. This is a popular litter box furniture IKEA hack. 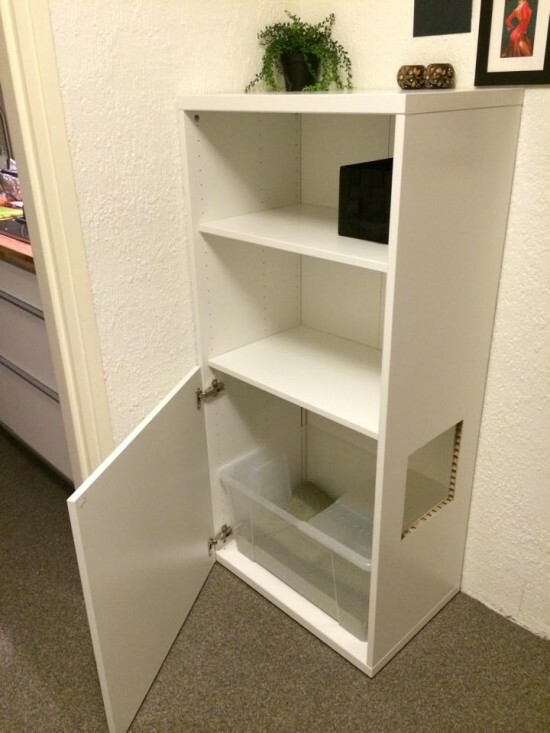 Simply cut a hole in the side of a Besta cabinet and install a door (which IKEA also provides) and you’ve got yourself a stealthy litter box location. You can also repurpose a Samla box as a litter box, and cut the lid in half to provide easy access for your cat to come and go. As a bonus, you can also use the shelving above the litter box enclosure for storage and decoration. Stairs are one of the most underutilized places in a home, making it a prime location for a hidden litter box. 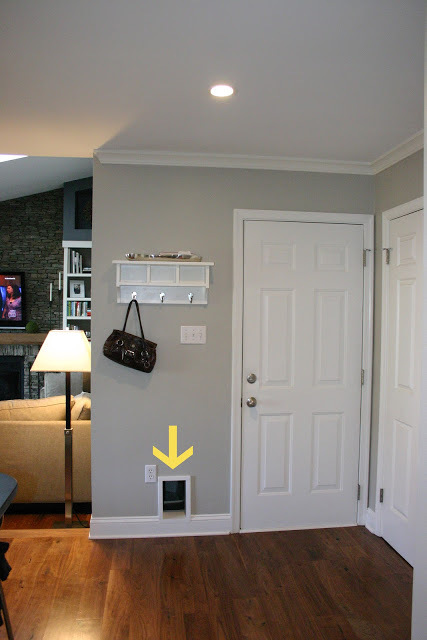 Cut a hole in the wall, place a litter box inside and install a cat door to repurpose that space as your cat’s own private washroom. 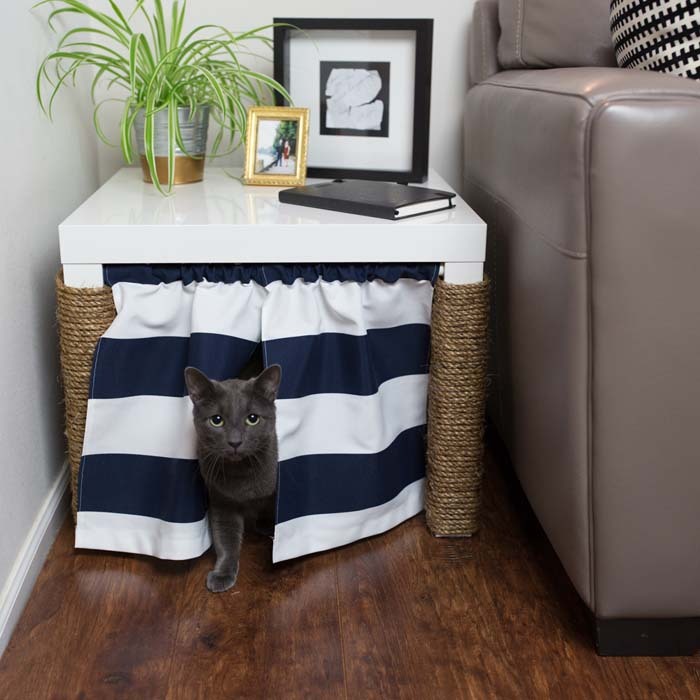 With a little bit of creativity, it’s easy to find a hidden spot to keep a litter box. As long as you regularly maintain your litter box by removing waste a few times a day and replacing the litter often, a disguised litter box is a win-win for you, your guests and, most importantly, your cat! If you’re ready to install your very own custom hidden litter box, find a carpenter in your area today!